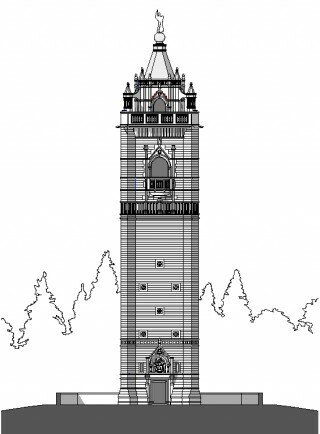 To mark the final completion of repairs to Cabot Tower, a new Morse code transmitter at the apex will from tomorrow once again signal -… .-. .. … – — .-.. (B-R-I-S-T-O-L), for the first time since 2001. The tower, providing extensive views over the whole city and beyond was closed to the public in 2007, when pieces of stonework began to disintegrate. It was built in 1898 to commemorate the 400th anniversary of the voyage to mainland North America by John Cabot (or, to give him his correct name, Zuan Ciabotto of Venice). It would be two more years before Christopher Columbus, who had voyaged to the Bahamas, would set foot on mainland (South) America. The tower, built of red sandstone with limestone dressings, was designed by William Venn Gough. Listed as a Scheduled Ancient Monument, on account of it having been built on the site of a medieval chapel with Holy well and on later Civil War defensive earthworks, it was reopened to the public in 2011. A commemorative plaque adorns the base, expressing “the ernest hope that peace and friendship may ever continue between the kindred people of this country and America.” This ernest (and earliest?) plea for a Special Relationship came 83 years after the British Army had sacked and burned the government buildings of Washington DC, including the Capitol and the White House. The programme of repairs undertaken by Bristol City Council with support from English Heritage cost around £400, 000 and has been overseen by architect Simon Cartlidge.